Restaurant Magazine recently revealed the 50 Best Restaurants in the World for 2007. Despite the fact that half the 651 voting panel members were new this year, and that twice as many came from Asian voting regions, consensus of opinion as to the world's best restaurants has changed little since 2006. With double the voting regions in Asia and thus two times as many eligible voters compared to last year (rules allow for only two of the five votes to be within a home region), it is more than surprising that only one restaurant from that seemingly culinary-wealthy area made it into the top 50. The Best Restaurant in Asia (a new category this year) went to Bukhara, in New Delhi, India. Each year since its inception, the gathering of votes and compilation of the list has become more measured. With a stable of well-traveled opinion-forming critics and chefs, restaurants that break through to the top 50 best restaurants in the world are impressing the very harshest and well-educated palates across the globe. Claiming the Best Restaurant in the World number one spot is El Bulli in Montjoi, Spain. This is the second year they have been voted Best Restaurant in the World, and it is not surprising given their gorgeous location and incredible menu. 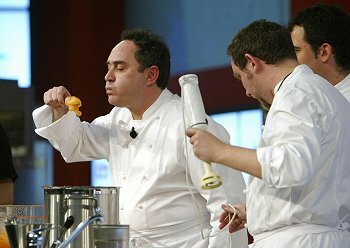 El Bulli was also voted Best Restaurant in Europe. And there is no tiring of Heston Blumethal's The Fat Duck. Retaining his position at number two, he also picked up the Chef's Choice Award, voted for solely by the chef's who appeared on the 2006 list. The Fat Duck is situated at Bray, about 30 miles west of London, England. A much deserved number three spot went to Pierre Gagnaire, in Paris, for the second year. France still stands as the godfather of the culinary world with 12 restaurants in the top 50. The United States enjoyed eight, the U.K. seven, followed by Spain and Italy with six apiece. Australia had two, with old favorites Tetsuya's and Rockpool. Thomas Keller, who not only had the top-rated restaurant in the United States with The French Laundry in Yountville, California (#4), but also was able to again claim the second highest American spot with Per Se in New York City (#9). Not a single London restaurant made the top 10. The top restaurants in the British capital were Nobu in 17th place, Hakkasan (19th) and Gordon Ramsay Royal Hospital Road (24th). Rarely-credited Nordic cuisine scored very well this year with ranking restaurants in Denmark, Sweden and Finland. Incredible credit must therefore be given to Danish restaurant Noma and its head chef Rene Redzepi who last year came in at a respectable 33 and is now the Highest Climber, up 18 places to number 15. New entries for 2007 include Turin's Combal Zero, Milan's Cracco Peck and Chicago's Alinea, whose 31-year-young head chef Grant Achatz (rhymes with rackets) has been heaped with praise in recent years. The breakthrough restaurant award is new for 2007 and awarded to a "hot property" on the world's restaurant stage. To be eligible, the winning restaurant must be less than five years old, and not have been in the top 50 list at any time. This year's breakthrough restaurant award goes to Gordon Ramsey's Maze (voted # 54), in London, thanks to his head chef, Jason Atherton. Noticeably missing was the Outstanding Value category (in 2006 the winner was Le Gavroche, London). Was it possible that there were no outstanding value restaurants in the world deserving of this year's award? And this year's Readers' Choice — the award voted for by readers of Restaurant Magazine — went to Shane Osborn's Pied a Terre in London, where chef Osborn holds two Michelin stars. The River Café, London, U.K.
To view the list of numbers 51 to 100, go to http://www.theworlds50best.com/2007_next_50.html. El Bulli's Adria has been dubbed the Salvador Dali of cooking. Gagnaire should be its Matisse: a bold, experimental chef cooking up a storm in the chic 8th arrondissement. If you want to venture to the frontier of luxe cooking today — and if money is truly no object — a dinner here is a must. Chef Pierre Gagnaire's work is at once intellectual and poetic, often blending three or four unexpected tastes and textures in a single dish. Ultra fresh and exotic ingredients include prawns flown in from Madagascar. Leave room for the famous Grand Dessert, seven mini delights such as rum baba, roasted rhubarb and buckwheat pancake. Service is great, as you would expect for the money. The wine list is competent and the wine service very good. Bookings: Reservations essential and are taken up to a month ahead. AE, DC, MC, V. Closed Sat. and two weeks in July. No lunch Sun. and Aug.
Every dish is a masterpiece at this amazing inner city oasis, where France walks down the aisle with Japan. Set in a tranquil Japanese Garden, you'll be amazed by what Head Chef Testsuya Wakuda can do with food. Tetsuya's cuisine is unique, based on the Japanese philosophy of natural seasonal flavors, enhanced by classic French technique. Tetsuya's renowned degustation set menu changes frequently. A typical meal could start with a plate of hors d'oeuvres — a gazpacho with spiced tomato sorbet, tartare of tuna with fresh wasabi and tataki of venison with rosemary and honey. Tetsuya's signature dish follows, confit of ocean trout served with unpasteurised ocean trout roe, followed by double cooked de-boned spatchcock with braised daikon and bread sauce, followed by a grilled fillet of grain fed beef with sansho & shiitake mushrooms. Desserts include an orange, honey and black pepper sorbet served prior to a blue cheese bavarois. Finally, early season berries with orange and Grand Marnier jelly and champagne ice cream, a floating island with vanilla and praline anglaise, and a flourless chocolate cake with a bitter chocolate sorbet and orange ice cream. Tetsuya's offers one of Sydney's most remarkable wine lists, and will match the dishes with wine available by the glass. The combination of excellent food and superb service will make this culinary experience unforgettable. Chef Thomas Keller, whose French Laundry, in Yountville, California, is one of the best restaurants in the United States, has opened his newest establishment far from the bucolic Napa Valley. The $12 million Per Se, with a sleek wood-and-glass design by Adam Tihany and views of Columbus Circle, is on the fourth floor of the galleria of shops in the new Time Warner complex, near Central Park. Not only is the food superb (try the sensational rack of baby lamb), it's also fun: miniature ice-cream cones filled with salmon tartare, "Jurassic" salt that's 30 million years old, tiny panna cotta made with cauliflower and topped with an oyster glaze and a dollop of osetra caviar. Don't miss the exotic desserts like poached Asian pear-Spanish almond tart and the perfect crème brûlée topped with a paper-thin sheet of glazed sugar. The service is amazing, unparalleled except perhaps by that at French Laundry. Per Se is grand luxe without the pretention: "Here's coffee and a doughnut," said the waiter, setting down a semifreddo in a cup frothed like a cappuccino alongside a small hot beignet shaped like a ring with a ball on top. San Sebastian is not far from the Atlantic border of France and Spain just south of Biarritz. In this lovely old port town, which looks as if time had stood still, is the Restaurante Arzak. Traditional Basque ingredients are lovingly prepared to produce dishes of superb standard that retain their regional authenticity. Appetizers include such delicacies as Salad of Baby Eels with Fresh Spring Onions; Pate with Carrot Bread and Currant Jelly; Fresh Chestnut Pasta with Vegetables and Veal with Basil; Codfish in a Sauce of Red Peppers and Walnut Oil with Fresh Cheese. Your main course here could be Oven-baked Mullet with Cream of Broccoli and Cardamom or Roast Pigeon with Ginger and Potatoes Baked with Apple and Turmeric. It is only in the desserts that Arratibel reverts to international favorites, offering such delights as Prune Tart with Chocolate and Palm Honey or Orange Crumble with Dried Apricots and Vanilla covered with Condensed Cream with Pistaccio Puree and served with Sorbet. Another favorite dessert is Warm Chocolate Cake with Orange Ice-cream and Raspberry Coulis. Whatever the choice, one's dishes are sure to be interesting, often regional, and always full of flavor and superbly prepared. No wonder many people living 200 kms into France will specially drive to this restaurant to enjoy fine Basque cuisine. Bookings: Annual closing from June 18 to July 5 and from Nov. 5 to 29. Charlie Trotter's is regarded as one of the finest restaurants in the world. For over 18 years, the restaurant has dedicated itself to excellence, so expect some of the best, most innovative food on the planet. If you're not eating in the kitchen (where you get the 15-course Kitchen Menu), your options are the Grand Menu or the Vegetarian Menu, six-course degustations that offer the finest, most pristine ingredients in multi-faceted dishes that make the server's detailed descriptions absolutely necessary. Combinations are complex and often surprising, with influences from just about every world culture that cooks. You might find yourself starting with a small cube that alternates thin slices of orange with house-smoked salmon, or perhaps a diver sea scallop with leek confit and Uruguayan Osetra caviar. Chestnut soup with butternut squash and cloves might precede whole roasted squab with black trumpet mushrooms, oxtail, collard greens, and red-wine-braised carrots, followed by South Dakota bison tenderloin with rutabaga, white polenta, and spiced date. Vegetables might include roasted organic beets with crosnes, porcini mushroom, and garlic chutney. The wine list has few equals in this city, and a good selection of wines is available by the glass and half-glass. It takes about five hours to make your way through the 25-course Tour menu at Alinea. Achatz was selected best new chef in 2002 and has learned from some of the best — at The Culinary Institute of America, Charlie Trotter's, French Laundry, Trio — but all this schooling and apprenticing has certainly not resulted in traditional cuisine. Achatz's very own unique style comes through quite clearly with highly refined dishes that sometimes require science lab or industrial products to prepare and always include imagination as an ingredient. His imaginative combinations, such as foie gras with roasted bananas in a chocolate-sweet onion sauce, and watermelon with shrimp aren't just risky; they're also incredibly delicious. When ordering lobster, the waiter will bring boiling water over rosemary sprigs at the table, so it perfumes the air and adds a new level of complexity to the lobster dish. Unless you have a deep education relative to wine, put yourself in the hands of one of the learned wine stewards. Try their peeled grapes dipped in peanut purée then wrapped in brioche, frogs' legs with spring lettuces and morel or pineapple three-ways with Iranian pistachios. Any multi course you order and everything you will try is deliciously unique in every way. Chef Paul Owen's innovative and creative cuisine has been matched with an imaginative setting awash in candlelight and art, where every table has a view of the Caribbean Sea. The restaurant is located on a cliff top, overlooking the calm waters of the Caribbean. First opened in 1995, The Cliff has established itself as one of the finest and most popular restaurants in the entire Caribbean. Open for dinner only, the restaurant is truly magical at night when it is illuminated with candles and torches for a romantic ambience. The Cliff is famous for cuisine that blends the flavors of the Caribbean with those of other nations. Diners can begin their meal with classic appetizers such as foie gras and chicken liver parfait with apple and raisin chutney and port glaze, ravioli filled with smoked salmon, cream cheese, spinach, or snails in puff pastry. Chef Owen's entrees cover the gamut from traditional dishes such as filet of beef, duck breast with wild mushroom sauce, veal chop with Dijon mustard and tarragon sauce to dishes infused with the exotic such as Thai curried shrimp and grilled snapper with three coriander sauces. Don't miss the restaurant's sinful desserts which include such classics as crème brulee with red berry coulis, chocolate mousse, petit fours as well as baked apple crumble and white chocolate cheesecake. Ramsay's first and best, established in 1998 and sporting a well deserved three stars since 2001. When he's not roasting his kitchen staff, Ramsay oversees a particularly intimate setup here — there are just 14 tables. At $213, the seven-course menu prestige is great value, especially with the wine list starting at $30. Treats include tortellini of lobster and sautéed loin of venison with creamed cabbage and bitter chocolate sauce. Joel Robuchon doesn't have tables in his restaurant — diners sit on bar stools around the open kitchen. So, one of France's best restaurants is a long way from the haughty haute cuisine you might expect. Le Figaro was in no doubt: "C'est une revolution!" Expect to pay about $186. Head Chef Fergus Henderson is working wonders with some of the strangest cuts of meat you will eat. Once a smokehouse, they have cleverly kept the white stone walled setting intact. Complete with its famous in-house bakery, the bread, which greets you as you sit down, is a welcome appetizer. Mainly a meat eating paradise, the menu changes every day and the latest fare can be found on their Web site. Their Widgeon, a gamey duck, is soft, succulent and unforgettable. Their Ox tail is served braised, in delicious dark gravy, is fall-off-the-bone incredible. To make the dish an altogether melting experience the accompanying mash is a perfect sidekick. With an excellent wine list, St John is the perfect dining experience.